Parasitic plants obtain nutrients from another (host) plant, typically to the detriment of these hosts. Though these plants are a diverse group of organisms including over 4,400 species worldwide, they are poorly studied. Mistletoes, a group of parasitic plants comprising over 1,500 species, have intricate relationships with different host species, pollinators, and seed dispersers to carry out their life cycle. 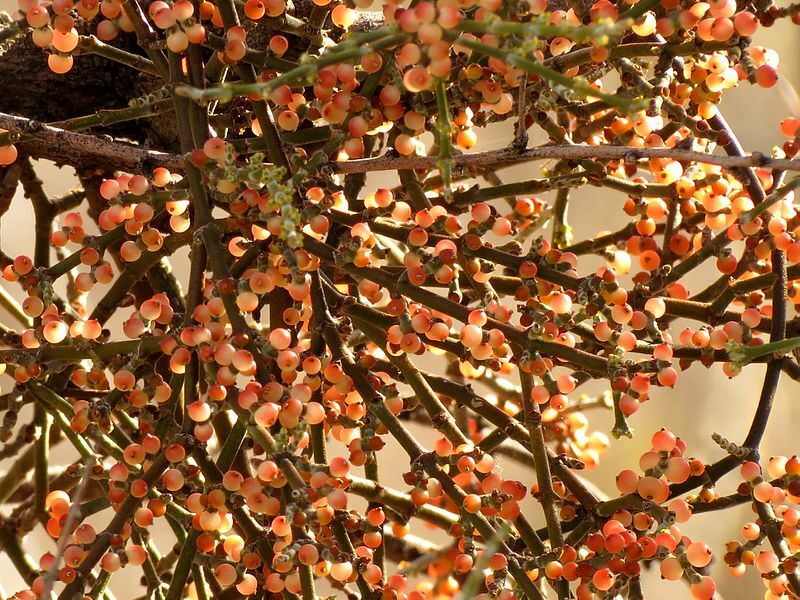 The authors used flowering and fruiting data of desert mistletoe (Phoradendron californicum) and five host plants from the USA-NPN’s National Phenology Database from Arizona and California to better understand the reproductive biology of this common arid system parasite. The authors found that flowering was not synchronous between hosts and parasites. The peak in flowering of mistletoes on mesquite occurred several weeks later than mistletoes on other hosts such as acacia. Across host species, mistletoes flowered earlier in the season than their host plants, but not in the same order as their host plants. These findings show that mistletoes are not constrained by their hosts when it comes to phenology and use diverse strategies to maintain reproductive success. As parasites, mistletoes rely on many different species for their survival, resulting in a complex array of species interactions. Through this study, the authors shine light on species interactions that have implications for species mismatches and increased competition. For example, if hosts and their mistletoe parasites share the same pollinators, any overlap in flowering time could result in increased competition for pollinators. Your observations of phenology through Nature’s Notebook are important to help scientists better understand the interactions between parasites and their host plants. Since Nature’s Notebook provides a way to track individual plants over time, your observations can reveal differences in phenology not only among species but also among individual plants. In this study, that capability was critical for teasing apart the differences in phenology among individual host plants and host species. Citation: Yule, K.M., Bronstein, J.L. 2017. Reproductive ecology of a parasitic plant differs by host species: vector interactions and the maintenance of host races. Oecologica. Doi: 10.1007/s00442-017-4038-6.